Since October 2010, it has been a roller coaster of immuno-suppressive treatment cocktails and therapy to regain strength I lost while in the hospital for 24 days in September 2010 due to an apparent “flare of my DM.” After my initial poor reaction to IVIG (intravenous immunoglobulin) in January 2010, we became friends for 5 days each month, as IVIG was my main treatment from September 2010 through February 2011. I would like to believe it helped with my strength and energy. So hard to really know since I was also on high dose prednisone and Cellcept at the same time! I was blessed each month to have family or friends take me to the infusion center and sit with me as this strange substance sourced from thousands of donors fused with proteins in my own blood. I imagined all the new antibodies having stories and lives of their own-being strong and eager, able and bursting with health and wellness-kicking all my sick antibodies to the curb! It took a lot out of my body each week, but I kept going, and when I was not feeling depleted, would focus on connecting with fans and friends online, and even managed to shoot a new music video at the end of January and digitally release an album in March 2011! In addition, I had help from home occupational therapy and physical therapy from October through December 2010 to help regain my physical strength and some stamina. In occupational therapy, I would focus on sitting up unsupported and playing as many songs as I could on guitar. After 6 months on IVIG (around February 2011), my rheumatologist began seeing some evidence in my blood work that either I was not tolerating it as well or was getting less benefit from it and recommended stopping it for awhile. In May 2011, still on Cellcept and tapering prednisone (I was at 13 mg), I experienced some of the same symptoms as just before hospital: weight loss, digestive issues, muscle weakness and problems swallowing. To avoid another flare, my rheumatologist upped the prednisone and recommended stopping the Cellcept and trying another immuno-suppressive treatment: Imuran or Rituxan. I opted for the less risky Imuran in June 2011 and within a few weeks noticed I was having some side effects including abdominal pain. That combined with my blood work, high liver function levels and high amylase and lipase (pancreatic enzyme) levels, was enough for my rheumatologist to recommend discontinuing it. The hope was the pancreatic enzymes would come down on their own. It’s now December and I’m still dealing with those $%^& enzyme levels! So I continued just with prednisone since around beginning of July 2011. Again I was tapering prednisone, just one milligram per week, and when I got to 16 mg in October, I noticed familiar symptoms again with weight loss, digestive issues and some initial problems swallowing… back up went the prednisone! Plus lucky me, to really ensure no other gastro issues were rearing their ugly heads, combo colonoscopy and endoscopy! Jackpot. 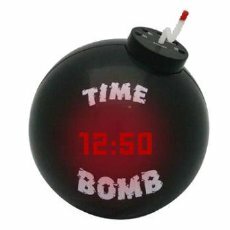 Oh the fun of the prep… or what I called Operation Whooosh! The good news is no cancers were found! 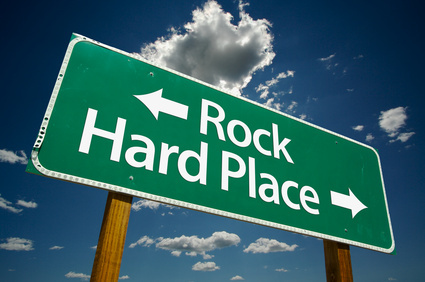 So once again, I find myself between a rock and a “harder rock.” I have no idea how long this DM will be with me and can’t stay on this dose of prednisone safely for years to come (without potential for more nasty side effects); so what is that magical cocktail that will allow my body to wean or at least lower the dose of prednisone… is it Rituxan? The next treatment I am being asked to consider is what I feel is most risky and least studied for DM. Rituxan is an infusion, but unlike IVIG, administered much less frequently. It targets a different part of the immune system/lymphocytes than all the other treatments I’ve previously tried: suppresses the B cells instead of the T cells. If there is an opportunity to improve my quality of life; if there is more potential for additional energy and stamina and possibly to lower my prednisone, then don’t I owe it to myself to try it? The benefits just may outweigh the risks and any of my fear or anxiety over trying a new treatment… again. I guess I had been feeling that I was managing this DM ok for the past 9 months with prednisone, until I realized I had to keep upping my dose to avoid possible “mini flares.” That is the hardest part-knowing whether my symptoms that creep up are DM or something totally unrelated… It concerns me that I may not be able to manage DM now or over time with prednisone alone. 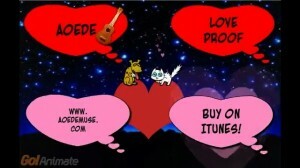 Love Proof: one of Aoede's new music videos! So what is most remarkable to me is that despite all of the health issues, I kept and continue to keep going full steam ahead on the music. As I mentioned in Dermatowhat?? Pt. 10, In February 2011, while still getting monthly IVIG infusions, I released my new website and started my first blog Dermatowhat?? (on living with DM). I also began engaging with new fans on twitter, Facebook and other social networks and released my first music video. I released my new album Affair with the Muse digitally on iTunes in March 2011. And for the past 9 months, I’ve been writing and recording more songs for an album, engaging fans through social networking, working on completing a music video, given radio interviews, won a music contest, been nominated for two categories of indie music awards, successfully funded a Kickstarter for my next album, and licensed songs. All except for parts of the music video shoot I’ve done from home. 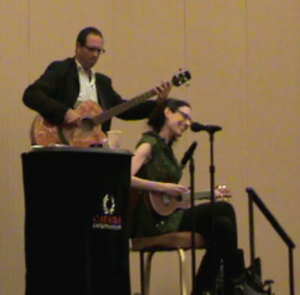 In September 2011, the music and the health issues came together when I spoke and performed at the Myositis Association’s annual conference in Las Vegas. Being asked to tell my story was an incredible privilege and honor. Not only was it a milestone of sorts just to get there and be present at a multiple day conference, but also because it was my first public appearance in over a year. I could feel the support in the room as I told my story and sang and played from my heart. My mom and dad drove out to be there (my 94-year-old grandma accompanied them, but fate had it that she would be in the hospital during the performance), and seeing their faces among those in the room made me feel loved and blessed beyond what words could convey. People came up afterwards thanking me and telling me what kind of impact my story and performance had on them. It made me realize just how significant being there really was-connecting through story and song with the very people who understood just what I was going through. It illustrated the kind of inspiration or muse I had become to the very people who most needed it. In Dermatowhat?? Pt. 10 I include excerpts from my talk, “10 Confessions and Secrets of a Singer-Songwriter Who Became a Muse.” I will simply say here that being in a room full of people who share this rare disease-fighting some form of myositis- Dermatomyositis, Polymyositis (PM) or Inclusion Body Myositis (IBM)-was incredibly supportive and empowering. I learned as much from the people around me as I did from the experts. 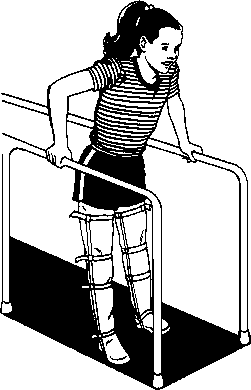 For example, I always thought the treatment options and some disease symptoms were similar among all myositis, but learned that isn’t true particularly for those with IBM. Having Dave by my side eager to learn, share, meet others, support, and play music was also such a blessing, and I could not have managed without him. I noted earlier Aoede was nominated for some indie music awards. I can’t express how much this nomination means to me considering just what kind of path I have been on to get here. It means to me that if you truly believe in something, if you dream it and imagine it, you can make it come true. Your body might be waging war on itself but your spirit and muse can not be crushed. In my case, it means I will keep doing everything I can to make music, to bare what’s in my soul, and to use it to inspire and connect with others. 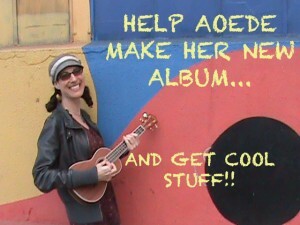 This Kickstarter project to fund my next album is a perfect example. You never know what kind of support and help you will get until you ask. Asking and receiving is the hard part, but I know that this is the right path, and I’m eager to see what the universe will deliver next!